The San Diego California muscle strain injury attorneys at DiMarco | Araujo | Montevideo are well aware from their over three decades of experience that muscle strain injuries can severely affect your life. You deserve help protecting your right and getting you back to regular life as soon as possible. If you or a loved one has strained a muscle, call the injury law firm that has a successful track record of handling muscle strain cases. This is true regardless of whether your muscle was strained while you were playing a sport, exercising, working, or at home. Receiving prudent legal help as soon after an injury as possible is critical for your overall recovery. It is very helpful to have seasoned San Diego injury lawyers guiding you from the beginning. Call (619) 946-6466 today to allow our work injury and personal injury law firm to start helping you and maximizing your potential compensation. We want you to focus on healing while we focus on fighting hard for you. Two other names that have been given to muscle strains are pulled muscles and muscle tears. Muscle strains can be the result of excessive force that is directed at the muscles. This causes the surrounding tendons and muscles fiber to become damaged and/or torn. The sudden overextension of a muscle might be very painful for the injured person and can take a long time to fully recover. Muscle strains can happen in many ways including when someone is lifting heavy objects, exercising, playing sports, doing daily chores, and working. This happens to athletes when they try to change directions too quickly and they end up pulling their hamstring, quads or another leg muscle. Our firm has seen most types of muscle strain injuries over its 30+ years. 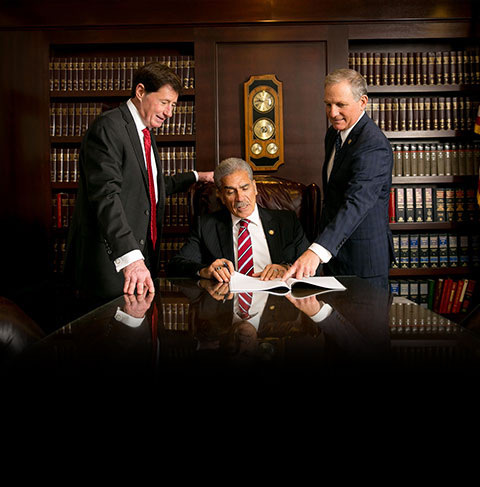 We have the necessary experience and diligent work ethic to take care of your case. The following is a list of the typical causes for pulled, torn or strained muscles: car accidents, defective products, on the job accidents, motorcycle accidents, sports injuries (especially tennis, football, soccer, wrestling, and track and field), walking or running on an uneven surface, slip and fall injuries, work injuries, bicycle accidents, weight lifting too quickly or too intensely, pedestrian accidents, crosswalk accidents, construction site accidents, and trying to stop your body too quickly or awkwardly. If you are experiencing any of the following symptoms, it is important to seek immediate medical help: You heard a “popping” sound when the injury took place, you cannot walk, you have a lot of pain and swelling, you have a high fever, or you have open wounds. Doctors now have a system to grade the severity of muscle strains that is mostly determined by how much stretching or tearing has happened. Severe discoloration and swelling symptoms point to the most severe strains: grade 3 injuries. This is because the muscles have been torn completely. Grade 2 muscle strains cause less pain than grade 3 and the muscle is partially torn. The patient does lose strength in their injured muscle(s) for grade 2 injuries. Tenderness, bruising, and swelling are additional symptoms of grade 2 muscle strains. Grade 1 injuries are slight enough that they do not actually affect the strength or functionality of the muscle. Some muscles are strained more often than others. They are: abs (abdominal) muscle strains, pulled backs, hamstring muscle strain, calf muscle strain, lower back muscle strain, groin pull or muscle strain, quads (quadriceps) muscle strain, leg muscle strain, chest muscle strain, Achilles tendon tear, tearing the rotator cuff, knee (or plantaris) muscle strain, bicep muscle strain, and arm muscle strain. It is important for you to call the doctor for medical advice if you’ve been injured. Using X-ray machines and other diagnostic and imaging devises, the doctor could be able to determine whether or not there was any damage to the surrounding bones and your body. Surgery is a possibility for Grade 3 muscle tears. Muscle strains, pulled muscles and muscle tears happen so frequently to employees on the job that they are consistently in the list of the top five work injuries. The typical ways people pull their muscles at work are: improperly using farm, construction or factor equipment, falling, tripping, not using proper body mechanics, lifting heavy objects, and stopping, twisting or rotating too quickly. Our San Diego work injury law firm has helped muscle strain victims with workers’ compensation for over three decades so we are well prepared to help you. Sprains and strains do sound similar but they refer to very different parts of the body. Strains refer to tears or pulls to muscles and tendons while sprains refer to injuries that occur to ligaments. You can call us twenty-four hours a day to schedule your free initial consultation and case evaluation. You will speak with one of our injury attorneys during the free meeting regarding your case, your injury, your legal options and you will get your questions answered. We work on a contingency basis for all of our injury clients. This means you only have to pay us if we win your case. The San Diego muscle strain injury attorneys want to make this process as easy on you as possible. That means that if you are unable to get to our office, we will come to you at your home or hospital room. We are available to meet during Monday through Friday between 8:30am and 5:30pm and we will also meet you, by appointment, on Saturdays, Sundays and in the evening. We have probably all witnessed a backyard football game sadly come to an end when someone tries to accelerate too fast or stop too quickly and pulls their hamstring (the biggest muscle in the body). The best ways to prevent these injuries include starting your physical activity slowly with a light warm-up and then proper stretching, staying in good cardio and physical shape, and being mindful to always use proper form while running, turning your body, lifting weights, or playing sports.